Yeah they sell a lot of asda George in Lidl don't they. Plus if they did, then care to loan us your time machine. Love how nowadays you've never seen the thing and it suddenly appears to be a "rollback". 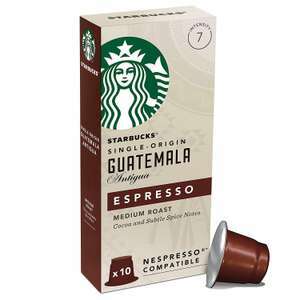 Still - seems to be much better price point than overpriced Nespresso. Heat added. I think even with the money off they are cheaper via Amazon. I got a free sample of Starbucks capsules and I already buy l'or and Nespresso capsules. I got to say, until Starbucks sort out the quality of the capsule itself. It is not worth it at all. It tears or brakes too easily, and leaves you with the mess of coffee grains everywhere. Not a fan of these in my Nespresso machine. L'or capsules work better and are on a cracking deal today. I just bought two of these this morning in Tesco leicester for £22.50 each. Worth keeping your eye out! I use the Morphy Richards U:PODS. £5 for 50 on Amazon. Not had one fail in either this machine or the Magimix machine at work. All pods fully pressurised which I think is the key to having them puncture in the machine correctly. And they taste lovely! I use Percol ristretto pods on subscribe and save from Amazon. Not the cheapest, but the pods are compostable, which is what I want. Have tried Aldi ones, which tasted good and L'Or, but they both occasionally got stuck/crushed in my machine. N Most promotions from Nespresso are more or less the same value: A Nespresso Inissia is worth around £50 when on offer (drops to this price every couple of months or so). Option 1: If you buy an Inissia when there is the £40 store credit promotion, then you are essentially saving £40. (good if you just want to make espressos) Option 2: If you buy an Inissia when there is the free Aeroccino when buying 150 capsules promotion, then you are essentially saving £50 since that's the RRP of the Aeroccino (good if you prefer lattes over espressos). Option 3: If you opt for the £18 per month 12 months subscription, you get £18 worth of store credit every month (around 50 drinks which will stack up fast if you are not a regular drinker) and you get the Inissia for £1, so you are essentially saving £49, but you commit to spending £216 on Nespresso in one year. Yes, unless you really need one of these right now, you're better off waiting until the you can get the machine for more or less the same price as the value of vouchers you can use to buy coffee. If you are after the frother as well, you might as well pay the extra and get this one. You'd get the £60 promo credit to buy pods. Frother is a good deal, but 50 quid for a fake Nespresso manchine; not so much. Why do this when the Inissia is regularly found at ~£50? Thanks, just got it from John Lewis as are pricematching with 3 year warranty. If this can produce the same great coffee that my 5 year old magimix can then that's a cracking price! Bought thanks. Didn't realise they had done an entry model so cheap, that'll do for the bedroom nicely! The irony is that the manufacturer sells this machine on their own website for £10.00 more then their own “stores” on Amazon and eBay. Rather than weaken their brand they sell on these international tax-dodging websites, lose an additional chunk of profit, and dance with the devil. Just so you know eBay is also one of the "American tax-dodging multi-nationals..."
Amazingly Amazon isn't the only place to buy products. It's actually quite easy to get by in life without giving all your hard earned to American tax-dodging multi-nationals - without spending more. L'OR ones are nice and are £20 for 100 at amazon just now. 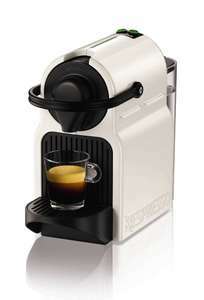 Theres lots of alternatives out there but the nespresso original pods are really nice. Oh....also, do you have to get a frother for these machines? Thanks. Never miss a 'Capsule Machine' deal again! Cannot see the relevant club credit for this machine. The link seems to just go to the club. How do we know what the relevant credit is? No need to pay p&amp;p if you spend your credit in a Nespresso store, such as Trafford centre or Meadowhall, FWIW. I love my Nespresso machine. But hey to each its own. Instant coffee is absolutely revolting. With the correct choice in capsules a good machine like a Nespresso can taste pretty good. Not as good as freshly ground coffee but much less hassle. All these machines operate at 19 bar pressure which is actually pretty good. Try Nespresso own intenso coffee. Make an espresso shot and add whatever quantity of water you want. I use one in work for convenience. That being said, I love my Nespresso machine. And more third-parties are producing aluminium pods - L'or, Kenco, and Douwe Egberts. L'or are on a deal at Sainsburys currently as well. Also be careful. These cheaper machines don't work as well with Nespresso-compatible pods, the likes of Taylors and CafePod. The pins don't pierce the plastic very well, a deliberate move so that they would only work with Nespresso's aluminium pods. i have the expert machine total bloody joke does not work with Android, works with Apple but constant errors and now I can't even login to the damn app to talk to the machine. For the few weeks I had it working great potential could tweak my coffee settings and set a coffee to brew in the morning for me then setup before I leave for the Mrs.
loooool! Brew remotely. Step 1. Turn on machine Step 2. Insert Coffee Capsule Step 3. Place cup on drip tray Step 4. Go and find your phone and press Brew Step 5. Go back to the kitchen to get your coffee. On a serious note, can you get £ rewards to spend on capsules?. I got the same machine via Amazon Warehouse for £55.97 as I think it will have been automatically reduced due to this misprice. Anyway, applied for the £60 and on my used machine and its been agreed and creditted! 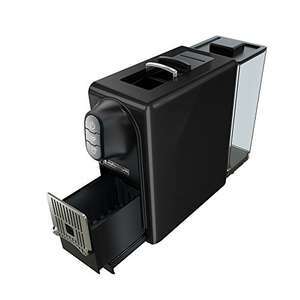 Machine with Aeroccino + £60 pod credit for £55.97! Worth a try if anyone else cleared out the warehouse deals. Maybe. You could argue that by recycling then in bulk at a specialised facility they do it much more efficiently. Who knows! Was reduced to £35 in mine this week. I got one last year for £25 when it was reduced. £49.99 if you click the link, £39 if you catch the offer, sometimes if you catch it right the Nespresso machines with coffee vouchers it can work out well. Aldi also have an Ambiano Milk Frother for £19.99 that's a good price and now do a good range of coffee capsules. So, is it £49.00, £49.99 or £39? Not that i'll be buying one. what capsules are these compatible with? 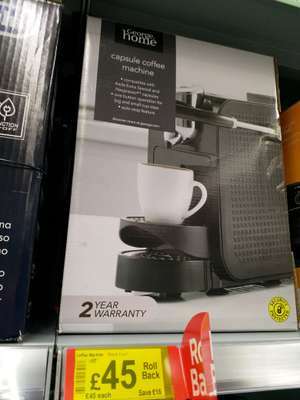 £40 for a machine that just makes coffee, is this serious? Already gone up to £60. John Lewis have them for £40. Thanks OP, managed to get one for the new house. Will be sold out in a couple of minutes. Thanks, frustrating, I was told I just needed the sticker from the front of the device. Do you need receipt for proof of purchase? I received mine as a gift and didn't seem to get very far with registering for these promos.. Cold, also £45 at Currys on top of all the other places mentioned. This is 45 quid from Debenhams (maybe plus delivery) and Lakeland (free delivery), both in stock and of course qualifies for the coffee vouchers. Better to buy the 70 quid one with aerocinno for the 75 in vouchers then sell on the aerocinno though. Vouchers come in 3 sets, but it's not like you'll buy one and not buy coffee for it!